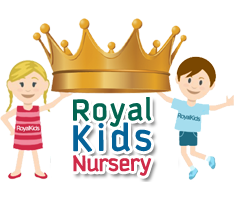 Parents can be confident that, by choosing Royal Kids Nursery, their child will receive the very best in early childhood education, delivered by qualified professionals to world-class standards. Our curriculum is based on the Early Years Foundation Stage (EYFS), which is the statutory framework for schools in England. This sets standards for the learning, care and development of children from birth to 4 years old. Children develop and learn in different ways and at different rates. The framework covers the education and care of all children in early year’s provision, including children with additional needs. Learning through play is at the center of our curriculum and we pride ourselves on creating a child-centered environment, with children learning through self-discovery, games, interacting with others and exploring their own creativity. Teaching is centered on a series of cross-curricula themes that have been selected to interest children. Each theme lasts 4 weeks, and is explored from numerous different angles to incorporate the 7 Learning Focus Areas. The Early Years Foundation Stage (EYFS) is a preschool education framework established by the British Government, it was launched in 2002, and has been recently updated. The EYFS program has seven primary focus areas. Personal, Social and Emotional development -We encourage children to become independent and self-confident, and make positive relationships with their peers and adults. Successful personal, social and emotional development is critical for young children for success in all other areas of learning and development. Communication, Language –Royal Kids Nursery provides a language rich learning environment which gives children opportunities for speaking and listening and for sharing their ideas and feelings. Literacy – Through listening to stories and sharing a wide range of books the children will develop a love of reading. At the same time they will learn about the shapes and sounds of letters through songs, rhymes and our Phonics program. Mathematics -This area of learning includes working with numbers, shapes, space and measures, and counting, sorting and matching. Children are encouraged to develop their experience of numbers, pattern, shapes and measurement through structured play. Knowledge and Understanding of the World-Young children are inquisitive to find out more and more about the world they live in and the people they encounter. Children at Royal Kids Nursery are encouraged to explore and investigate materials and to question how things work. This area of learning and development forms the foundation for later work in science, design and technology, history, geography, and information and communication technology (ICT). Physical development –Royal Kids Nursery gives children ample opportunities for the healthy development of body and physical skills. Activities to promote gross motor skills include running, jumping, hopping, skipping, riding tricycles, throwing and catching balls and bean bags. Fine motor skills are encouraged using a variety of resources including play dough, paint, crayons, scissors, beads and puzzles. Creative development / Visual / Spatial -Creativity is fundamental to successful learning. We give our children opportunities to share their thoughts, ideas and feelings through art, music, movement, dance, imaginative and role play activities.